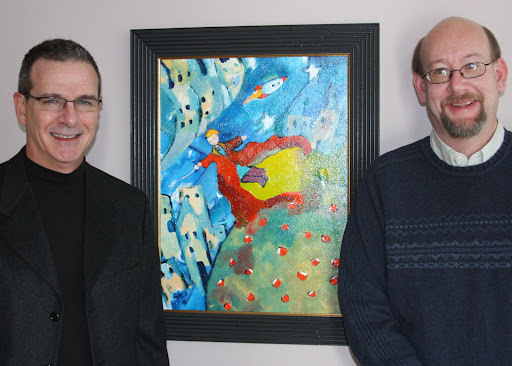 David L. Butler, Executive Director of the Knoxville Museum of Art and Zack Allen, Director of Children's Theatre of Knoxville with "The Little Prince" Original Painting by April Laragey - Stein on display of the Knoxville Museum of Art. The Painting is for sale to the highest bidder. All proceeds will go to the Children's Theatre of Knoxville. To see the painting please visit the KMA @ 1050 World's Fair Park Knoxville, TN 37916-1653 from now until December 20. Admission is free! The Little Prince - Make Reservations today!! !